Almost everyone wants to go faster on the bike, but not everyone has the additional time (or motivation) to dedicate to more training. Fortunately, there are a variety of ways to actually get faster without doing harder or longer workouts! Skills: A confident, comfortable rider that knows how to handle a bike is a fast and efficient rider. Practice skills such as carrying momentum, cornering, standing, descending, braking, pacing, group riding, etc. Mix it Up: This includes both discipline and terrain. One hour of mountain biking has a lot different demands than one hour of pavement or gravel. Similarly, a four hour ride with less than 1000 feet of climbing is a lot different than four hours with 4000 feet of climbing. Include variety by riding road, gravel, mountain, sustained climbs, rolling hills, flats, headwinds, tailwinds, and crosswinds! Rest: This is one of the most overlooked aspects of training and sometimes hardest to do. However, rest is crucial because it is during these times that your body actually has the time and energy to adapt and make the physiological changes necessary to make you fitter! Most people benefit from at least one full rest day each week and periodic longer rest periods. Bike Fit: A good bike fit will help to decrease numbness, increase aerodynamics (if that is a goal), prevent injury, and ensure that the proper muscles are being utilized with each pedal stroke. Nutrition: This is another component of training that is oftentimes underestimated. What you eat before, during, and after a workout (and really all the time!) is incredibly important in the quality of training and weight management. The body needs proper fuel in order to keep up with the rigorous demands placed upon it. Focus on high quality foods such as whole grains, fruits, vegetables, and lean proteins. Relax: Inexperienced or unconfident riders have a tendency to tense up on the bike. This uses a lot of unnecessary energy and actually makes bike handling much more difficult. Concentrate on relaxing your grip on the handlebars and keeping your arms soft. Equipment: If you have a lot of extra money lying around and are looking for an easy way to get faster, equipment upgrades definitely can help! Aerodynamic wheels, lighter frames and components, stiffer soled shoes, and aerodynamic clothing can definitely make you faster if you are willing to make the investment! For those not wanting to drop extra cash, simply maintaining the equipment that you do have can make a huge different in how smooth your rides are and increases the life of your current components. Tactics: This is incredibly important for racers looking to place better in their respective categories. 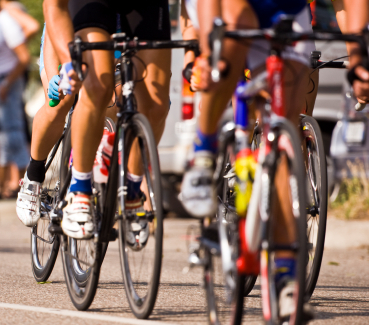 Learning how to race intelligently is a completely separate component from fitness. The fittest rider does not always win the race, so learning HOW to win races is a skill that needs to be developed. Usually this is best done by watching more experienced riders and just racing a lot yourself so that you can learn from your mistakes.